WP Job Board is a premium WordPress job board plugin. It works with any WordPress theme and integrates efficiently with a number of third-party providers, like Paypal and Stripe. Quick and easy to setup, this plugin comes with many of the little extras that the free plugins leave out, saving you time in the long run. 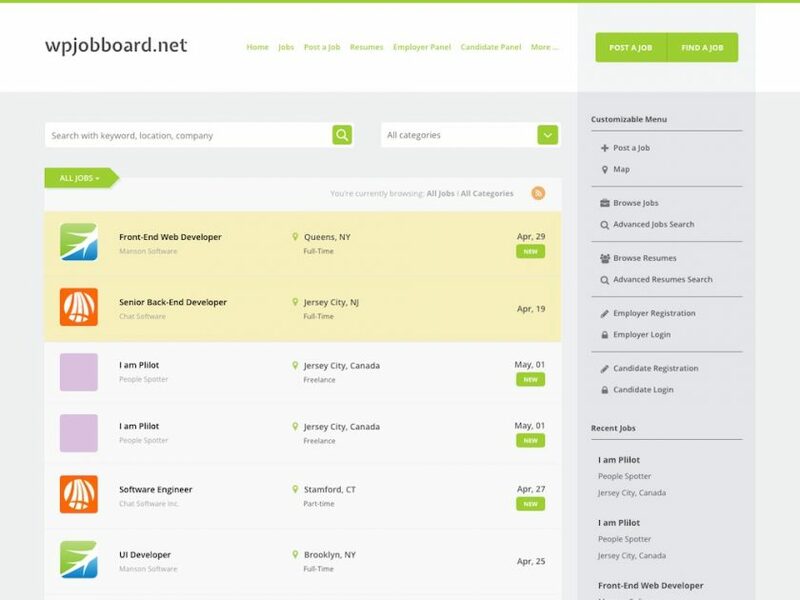 WP Job Board gives you full control over jobs and applicants. Manage, browse and modify jobs and applications all from within your WordPress dashboard. Use the plugins powerful visual editor to customize job listings and resumes. And you can even create membership packages and discount codes to help your site produce a revenue stream. Visitors can make the most of the advanced job searches, and employers can enjoy the ease of resume filters. Custom emails and alerts can also be created to keep users up to date with what is going on and engaged with your site. If you choose to purchase WP Job Board, as part of the package you will gain access to Jobeleon, a dedicated job board theme. This stylish modern theme is free to use and boasts an interactive customizable map, that lists active jobs and their locations. The WP Job Board plugin is an advanced tool, and is well worth the money if you are looking to set up a serious jobs board on your WordPress website.